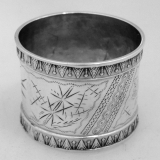 American sterling silver napkin ring with beaded borders by Gorham Silversmiths, c.1900. This handsome napkin ring measures 1 7/8" - 1 3/4" and weighs 30 grams or 1 ozs Troy. The excellent original condition and clear detail, with no removals, repairs or alterations, make this an especially attractive offering. Monogrammed S, the soft, warm, original finish is present, with no buffing or machine polishing. Spanish Taste Vin Cordoba 19th C.
Spanish Silver Taste Vin or Wine Tasting Cup from Cordoba, c.1850. 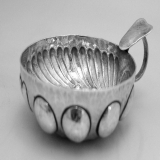 The center of the cup has a Charles IV 8 Real silver coin struck in the Mexico City Mint, dated 1797. 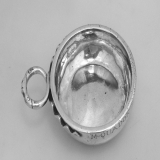 The ring handle has an indented, shaped thumbpiece and the body has assymetrical fluting and large round dimples. This special Taste Vin is 3 3/4" across the handle, 3" in diameter and weighs a respectable 69 grams or 2.2 ozs. Troy. The excellent original condition and crisp detail, with no monograms, removals, repairs or alterations, make this an especially attractive offering. The soft, warm, original antique finish is present, with no buffing or machine polishing. French Taste Vin or Wine Tasting Cup with 18th C. marks and early 19th C re-marks. 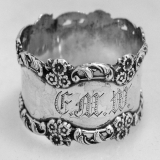 It was common for surviving examples of early French silver to have later assay marks in addition to the original marks. The marks are slightly rubbed but legible. This scarce and elegant Taste Vin is 4 a/4" across the handle, 3 1/4" in diameter, 1" tall and weighs a substantial 130 grams. It bears the ownerâ€²s name M Quadon in early block lettering along the outer rim. The excellent original condition and crisp detail, with removals, repairs or alterations, make this an especially attractive offering. The soft, warm, original antique finish is present, with no buffing or machine polishing. The soft, warm, original antique finish is present, with no buffing or machine polishing. Exotic and rare rose water shaker c. 1850. Made in Brtish Colonial India with stunning decorative embellishment and gorgeous peacock feather inspired repousse borders. It stands 10 1/2" in height and has a 3 3/4"diameter. It weighs a substantial 361 grams or 11.6 ozs Troy. The impeccable original condition and crisp detail, with no monograms, removals, repairs or alterations, make this an especially attractive offering. The soft, warm, original finish is present, with no buffing or machine polishing. 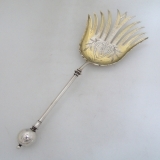 Rare and exquisite French 950 sterling silver Art Nouveau sandwich tongs with impressive applied foliate embellishment, c. 1890. A sumptuous and artistically crafted item that measures 4 1/2" wide, 3 1/2" long, and weighs 138 grams or 4.43 Troy ounces. The exceptional condition and crisp detail, with no monograms, removals, repairs or alterations, make this an especially attractive offering. The soft, warm, original finish is present, with no buffing or machine polishing. 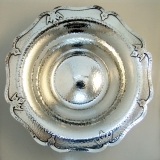 Sterling footed tray from British Georgian period. 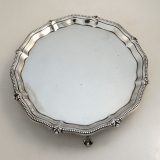 Made by master silversmiths of London 1799. Features a magnificent brite cut border with regal engraved shield embellishment. It is 10" in diameter and weighs an impressive 632 grams or 20.32 Troy ounces. The exceptional original condition and crisp detail, with no monograms, removals, repairs or alterations, make this an especially attractive offering. The soft, warm, original finish is present, with no buffing or machine polishing. 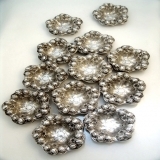 Twelve piece set of beautiful repousse sterling silver nut dishes by William Kerr Silversmiths of Newark New Jersey, c.1900. They each measure 3 1/4" and weigh a combined 314 grams or 10.09 Troy ounces. The exceptional original condition and crisp detail, with no monograms, removals, repairs or alterations, make this an especially attractive offering. The soft, warm, original finish is present, with no buffing or machine polishing. 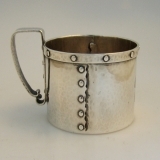 American sterling silver Arts and Crafts mug or cup by Shreve and Company of San Francisco, c.1910. This most unusual mug features both a riveted, strap work constructed hammered body and handle and measures 2 3/4" in diameter, stands 2" and weighs 93 grams 2.99 Troy ounces. 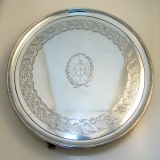 It has a ornate period monogram GLS on the side of the body. The excellent original condition and crisp detail, with no removals, repairs or alterations, make this an especially attractive offering. The soft, warm, original finish is present, with no buffing or machine polishing. 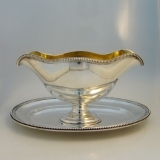 Grand and massive gravy boat with stunning gilt interior on 800 silver. Features attached under plate and was crafted by Friedlander in Germany c. 1900. Measures 10" long, 4" high, it weighs 564 grams or 18.13 Troy ounces. The excellent original condition and crisp detail, with no monograms, removals, repairs or alterations, make this an especially attractive offering. The soft, warm, original finish is present, with no buffing or machine polishing. 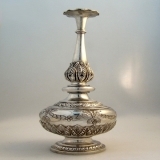 S. Kirk & Son, Co. Inc, master silversmiths of Baltimore, were the inspired artisians that created this beautiful repousse sterling silver sugar basket, c. 1920. This is the pattern that made them famous, featuring beautiful roses, daisies and chrysanthemums with foliate embellishment. It weighs a generous 237 grams or 7.6 Troy ounces and stands 4" in height with a 4 3/4 " diameter. The immaculate original condition and crisp detail, with no monograms, removals, repairs or alterations, make this an especially attractive offering. The soft, warm, original finish is present, with no buffing or machine polishing. 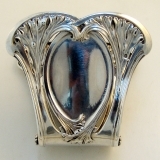 American sterling silver large ornate high relief Orchid napkin ring, c.1900. This beautiful ring measures 2 1/8" - 1 5/8" and weighs 50 grams or 1.6 ozs Troy. The excellent original condition and clear, crisp detail, with no removals, repairs or alterations, make this an especially attractive offering. Monogrammed W, the soft, warm, original antique finish is present, with no buffing or machine polishing. 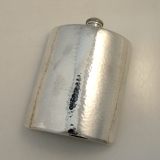 Superb handwrought sterling silver flask, made in Chicago by J. Myer Lebolt, c. 1925. 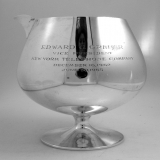 Influenced by other Chicago silver companies of the time like Kalo and Randahl, J. Meyer Lebolt found inspiration in the Arts and Crafts movement. 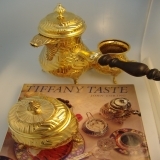 He added handwrought silver items to the families jewelery business as early as 1912. This impressive piece measures 6 1/2" in length and is 4 1/2" in width. It weighs a substantial 301 grams or 9.7 Troy ounces. The flawless original condition and crisp detail, with no monograms, removals, repairs or alterations, make this an especially attractive offering. The soft, warm, original finish is present, with no buffing or machine polishing. 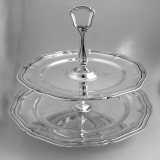 Elegant Italian 800 silver serving stand with two beautifully bordered trays. 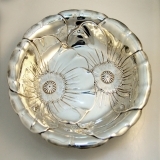 This refined and stylish piece stands 12" in height and measures 10 1/2" in diameter. It weighs a substantial 893 grams or 28.71 Troy ounces. The immaculate original condition and crisp detail, with no monograms, removals, repairs or alterations, make this an especially attractive offering. The soft, warm, original finish is present, with no buffing or machine polishing. 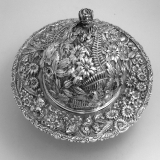 Amereicvan sterling silver covered butter dish by the Baltimore firm of Hennegen and Bates, c.1900. The original mazarin or drain pan sits properly in the dish and the cover fits well in any position, with the dish sitting flat. This magnificent and substantial dish weighs 529 grams or 17 Troy ounces, has a diameter of 7 1/2" and stands 5" in height. The excellent original condition and crisp detail, with no monograms, removals, repairs or alterations, make this an especially attractive offering. The soft, warm, original finish is present, with no buffing or machine polishing. 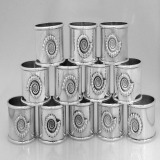 English sterling silver set of 12 napkin rings, made in London 1976. 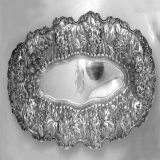 These rings are remarkable with their superb figural shell motifs, done in breathtaking detail. They weigh a combined 876 grams or 28.2 Troy ounces. Each one measures 1 3/8" in height with a diameter of 1 3/4". The immaculate original condition and crisp detail, with no monograms, removals, repairs or alterations, make this an especially attractive offering. The soft, warm, original finish is present, with no buffing or machine polishing. 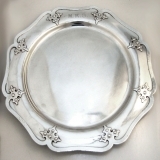 Grand and substantial bread tray in sterling with elaborate floral and foliate repousse border. Made by master siversmiths at Stieff in Baltimore, c. 1946. It measures an impressive 18" in length and 8" in width. It weighs a solid 663 grams or 21.38 Troy ounces. The impressive original condition and crisp detail, with no repairs or alterations, make this an especially attractive offering. The soft, warm, original finish is present, with no buffing or machine polishing. 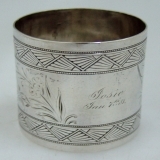 American coin silver napkin ring 1882. This handsome napkin ring measures 1 3/4" - 1 1/2" and weighs 29 grams or 0.9 ozs Troy. The excellent original condition and clear detail, with no removals, repairs or alterations, make this an especially attractive offering. Monogrammed Landes Shaw from Uncle John Feby 18th 1882, the soft, warm, original finish is present, with no buffing or machine polishing. 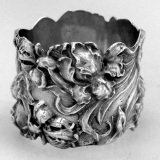 English sterling silver floral and scroll repousse napkin ring, Birmingham 1909. This beautiful napkin ring measures 1 7/8" - 1 1/8" and weighs 27 grams or 0.9 ozs Troy. The excellent original condition and clear detail, with no removals, repairs or alterations, make this an especially attractive offering. Monogrammed JS, the soft, warm, original finish is present, with no buffing or machine polishing. 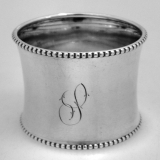 American sterling silver bright cut napkin ring by Gorham Silversmiths date marked for 1880. 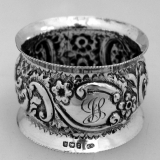 This beautiful napkin ring measures 1 7/8" - 2" and weighs 60 grams or 1.9 ozs Troy. The excellent original condition and clear detail, with no removals, repairs or alterations, make this an especially attractive offering. Monogrammed Josie Jan 7th 81, the soft, warm, original finish is present, with no buffing or machine polishing. 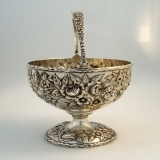 American sterling silver macaroni server in the Ball pattern by George Sharp, 1868. This unusual server measures 10 1/2" long and weighs 130 grams or 4.2 ozs Troy. The excellent original condition and clear detail, with no removals, repairs or alterations, make this an especially attractive offering. Monogrammed in an ornate period script H, the soft, warm, original finish is present, with no buffing or machine polishing. American sterling silver Arts & Crafts set 35 pieces in the Sunset pattern by Allan Adler, 1944. 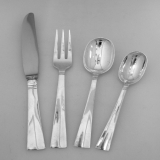 This handsom set consists of 6 place settings of 5 pieces plus servers: - 6 knives 9 3/4" long; - 6 Dinner forks 7 1/2" long; - 6 Salad forks 6 3/8" long; - 6 Teaspoons 6"; - 6 Oval Soup Spoons 6 7/8"; Serving pieces: - Cold Meat Fork 8"; - Butter Pick 6 3/8"; - Preserve Spoon 6 7/8"; - Sugar Tongs 4 3/8" - Long Handled Sauce Ladle 11 1/2". Total weighable silver 1323 grams or 42.5 ozs Troy, plus the six knives have solid handles, that weigh aprox. 2 ozs each.